I was doing an oil change and I had a pesky little drip from differential and figured I'd see if I could stop it. It seemed to me based on what I saw, it was either coming from the fill plug or the fitting above it that runs to the collection can. The top fitting was pretty snug but I could tighten it some. The fill plug was not really snug at all but seated in there pretty good depth wise but I gave it a 1/4 turns to make sure. Of course the plugs design it's one you can tighten down as the plug has no flange on the end. I also notice that it has some high temp gasket maker ( RVT?) on the plug. Once everything was done, went for a spin and got back and had a mess of oil under the diff. I really think the culprit for the initial and now bigger leak is the fill plug that I moved a few 1/4 turns. I got her jack up level and pulled the fill plug and actual got some oil came out which surprised me as I thought it wasn't supposed to be filed over that plug....or actually a little bit under the fill hole. Now I'm at the point of just draining the oil from the diff as I'm at my first 500 miles so probably wouldn't hurt to replace it. As you can see this is a KMS diff that was a warranty replacement from my original one which Olthoff Racing requested be change due to a howling he noticed while doing the install work. As you can see in the pics there are 2 plugs on the bottom. Any reason for 2 and which one is the drain ... I'd assume the lowest but you know how that goes!!!! Also what the best procedure to replace the oil in the diff as space is very very limited !!!! : ) Sure someone has a solid procedure on doing this. Is there a torque spec for the drain plug on re-installing. Finally what the best way to secure the fill /drain plug to minimize and leaks? I'm guessing the high temp rvt is a necessity on the fill plug. Thanks for any and all help.!!!!! Last edited by E5USMC; 09-24-2017 at 09:41 PM..
Once everything was done, went for a spin and got back and had a mess of oil under the diff. I really think the culprit for the initial and now bigger leak is the fill plug that I moved a few 1/4 turns. I got her jack up level and pulled the fill plug and actual got some oil came out which surprised me as I thought it wasn't supposed to be filed over that plug. I'm not going to guess on whether those plugs are for a cooler, catch can, or what -- but they shouldn't leak or drip. I will tell you that my custom ERA rear differential, (which is based on the Jaguar Dana 44 Powr-Lok unit), uses PTFE Teflon Pipe Tape on the fill plug threads, but uses Loctite PST Thread Sealant on the drain plug. I torque them both to 20 ft/lbs. Now, to get the oil in the differential, use an Oil Gun/Automotive Filler Syringe -- don't forget to include your limited slip modifier. Using the right oil, and the right friction modifier, is pretty important. Thanks....I'm gonna try the teflon tape on the fill plug. I think the diff was over initially filled based on how much gear oil drained when I removed the plug so that may be part of the issue. I emailed KMS to ask what oil level they recommended for their diff. Should it be to the fill hole or slightly lower. I've been told both. Also asked them what gear oil they recommend and if friction modifier was needed on the TrueTrac diff ( think that's what the T.T. stands for) ... again...been told yes and no. Hopefully get it figured out a sealed up tight!!!! You should certainly double check to make sure what you have, but the TrueTrac is pretty darn nice, and gear based, so you don't have clutches or friction modifier issues. Sometimes Powr-Loks will "ratchet" around corners and you have to drain the stuff and add more modifier to get it to stop. In my CSX (with same KMP diff as yours except you have the new billet cover ) I had a similar issue. During the install shakedowns, everything was great. Then on my first "long" drive (1 hr home) I found a big mess under the rear - gear oil everywhere! I check the level and it was about .5" below the fill plug, so it was initially overfilled, got to a real operating temp and puked, and found its new level. It initially had a breather tube pointed down at about the same height as the diff, which I believe may have acted as a siphon. I installed a catch can inside the trunk like on my KMP and it's been dry since. That drip from the fill plug was definitely a sign of it being overfilled (or the plug not nearly tight enough) but should have held anyways like patrickt said. With the new fill level and can, you'll be fine. I have the same KMS TrueTrac diff (not a fun swap into my CSX by the way even though it is a direct replacement). There are two breather options, depending on how you are set up. One is an AN fitting on top of the diff toward the driveshaft. KMS runs a line to a catch can in the trunk. The other is a fitting toward the top of the diff cover. Make sure one is capped and the other runs to a catch can. I received a call from David Kirkham today and he provided me some great info and advice on the differential and the best way to get it sealed up. Wow... can you say enough about David Kirkham!! What a nice guy and he really went above and beyond helping me on a product that he really didn't sell to me. This man and he business no doubt deserve all the accolades they have earned over the years. OK, so after you put JB Weld on the plug threads, and torque it down to 75 ft/lbs., and then weld a nice bead around the edge, then what do you do? Guess that might be a good idea!!! David recommended Valvoline 80/90 for gear oil. He felt that synthetic can be more prone to leak past seals but to determine is your car more street or track when determining your rear gear oil. The center 3/8 plug on the bottom is the drain and the offset plug is for the diff cooler with another one being on top of the diff. He said that the oil level should be right below the fill hole and to ensure the threads are cleaned of any oil or sealent residue before re-installing the fill plug. He mentioned while teflon tape can and will work, he prefers Permatex The Right Stuff when sealing the fill plug. He recommended to tighten it till the taper in the threads stops it then a slight snug to finish it off being careful to not over tighten it. The TT is indeed a TrueTrac and doesn't require friction modifier to operate. He also stated these thing run hot as heck and to not get concerned over the heat they produce as it's the nature of the diffs. High quality mineral gear lubes are required for use in Detroit Truetrac differentials. Regardless of the lube type, always use a GL5 rated lube with the least amount of friction modifier. Mineral lubes lacking friction modifiers (limited-slip additives) were historically recommended for all Truetrac applications because friction modifiers can slightly reduce the bias ratio (limited-slip aggressiveness) of Truetrac differentials. However, to address the continually increasing power outputs of modern powertrains, many vehicle manufacturers have switched to synthetic lubricants as a counter measure for increased axle temperatures and prolonged service intervals. In general, consult the vehicle owner's manual for the manufacturer's recommendations for lubrication type, weight and fill volume. This will ensure lube compatibility with the seal materials and bearings used in the axle. Eaton Performance technical support is available for any concerns in lube selection. I'm using Redline Heavy ShockProof® ( https://www.redlineoil.com/product.aspx?pid=44 ) in my helical gear differential (Powertrax Grip PRO https://www.powertrax.com/product-in...action-system/ ) with no apparent issues, though I note this from Powertrax (Richmond Gear): "Because there are no friction plates, no friction modifier additive is necessary. Always use a 80W-90 weight petroleum based gear oil with a GL-5 (or higher) rating, friction additive/modifiers should NOT BE USED. Synthetic oils and oils containing friction modifiers are not recommended." Last edited by cycleguy55; 09-27-2017 at 08:52 AM.. I recall a post many moons ago where you did a write up about this. It resonated with me so I kept the info on a now old defunct USB. I know I shouldn't uld back my stuff up better. From memory do you recall what, if any friction modifier you added? Try an aluminum plug in the aluminum diff, lot less expansion differential then metal/aluminum. You do not use any additives with Mobil 1 75w140 and it is a GL-5 Rating. Well.....got the fluid changed and all sealed back up. I used PTFE tape on both the fill plug and the catch can hose fitting. After a few lengthy test drives, she is tight as a drum!! TIC TOC, your differential may be a time bomb! The problem with the differential oil leaks on CSX Continuation Cobras and others that utilize the Kirkham Motorsports aluminum differential with the billet aluminum differential cover can stem from the way Shelby American and or whomever assembled the Continuation Series Cobras prior to delivery to the purchaser. After talking with David Kirkham about a differential oil leak issue that I had with a clients 6000 Series Cobra David asked me how the differential breather was installed on my clients car, I told him David then informed me that his billet differential cover did not have a breather oil deflector built into it and that if the differential breather was vented from this position that the differential would pump the oil out of the differential while the car was in motion, this is definitely NOT good for the differential! THE DIFFERENTIAL REQUIRES A PREDETERMINED AMOUNT OF OIL IN IT TO PROPERLY LUBRICATE THE BEARINGS AND GEAR FACES PROPERLY, if any amount of gear oil is being removed from the differential during operation it will ultimately damage the differential through lack of lubrication. I’ll call this next discussion “Tic Toc”, the reason I call this “Tic Toc” is because of the way the Continuation Cobras were setup by the manufacturer, albeit disregarding David Kirkham’s differential venting instructions. As before whoever installed the differential breathers on the Continuation Cobras utilized the fitting on the differential cover, remember the one without the oil deflector, and connected it via a rubber hose to the bottom fitting on a pint sized brake reservoir can, here’s where the “Tic Toc” comes in. Your differential starts off with the proper oil capacity, filled to just below the fill plug hole. You’ve just filled your fuel tank and you decide to go on a drive say 100 miles through the back country, not stop lights, no traffic, just a great day to go for a drive. Unaware to you the driver, the guy that just spent $130K + for your new toy, the differential is pumping the differential oil from your differential into that pint sized container which quickly overflows and spills out onto the ground and whatever doesn’t spill out is now trapped in that pint sized container until you come to a stop for a period of time. Remember as long as you are moving the oil is being pumped OUT of the differential, when you stop whatever oil is in the container returns back to the differential or at least that’s the manufacturers theory. Remember the amount of oil that escaped from the pint sized container will never make its way back to the differential. So how many times “Tic Toc” do you think this process of driving and stopping needs to happen before the differential is damaged? Remember EVERY time you drive the differential oil is pumped out. While talking to David Kirkham about the issue he said that it takes very little fluid loss before damage starts occurring. I believe David as my clients car traveled less than 1500 miles before all the bearings and the ring and pinion needed to be replaced. When driving roughly 100 miles the differential will loose more than one pint of oil. David Kirkham instructed the manufacturer that the breather should be routed to to the breather port at the top front of the differential near the pinion and that the port on the differential cover was for the oil cooler return hose. That makes sense as the oil cooler return hose would have enough pressure to overcome the pumping action of the ring gear. So who should be responsible for how the manufacturer assembled their product, the purchaser or the manufacturer who failed to follow the component manufacturers installation instructions? If you are a CSX Continuation Cobra owner check how your differential breather system is configured before you are looking at an expensive or possibly deadly consequences should your differential lock up while driving. In the photos that are provided by the original poster of this topic it appears that the differential breather is installed on the incorrect differential port, the billet differential cover port. Last edited by CompClassics; 04-13-2019 at 11:42 PM..
Superformance installed a lot of our differentials in Shelby cars. From what I have heard (if anyone has other information please let me know) Superformance runs the breather line into the bottom of the catch can from the back of the differential cover plate. This isn't how we run them, but many people do run them that way. We have told Superformance we run them differently (we run them to the top of the pinion oiling hole) but as with most cars--and especially race cars--everyone does things differently. We run our differential breather lines to the hole on the top of the differential, right on top of the pinion. We have found this is the area that best breathes the differential for us. We run the line to the bottom of a catch can which we mount up as high in the trunk as we can. By running the line to the bottom of the catch can it allows for the oil to drain back into the differential. As you drive along, some blows out and some drains back etc. etc. etc. When you stop it all drains back in. You have to make sure your breather hose doesn't have a place that can catch and trap the oil from draining back. Whatever you do, don't route the breather line to the top of the can--it won't allow for the oil to drain back down into the differential as you drive along. With the line in the top of the can oil can only pump out of the differential and into the can--which deprives the differential of oil. Eventually the can will fill up and overflow. There isn't a lot of oil in a differential anyway and if much oil leaks out then the differential may run out of oil. Differentials--especially the high performance Eaton TruTrack gear differentials--will not tolerate being low on oil. Mine is vented from the back of the diff cover and is attached to the bottom of catch can which is mounted high up in the right rear arch of the back fender ( by the back of rear break light). Definitely seems that gravity would allow oil in the can and hose to find its way back into the diff once cooled. Hopefully it’s setup correctly or at least satisfactory. You need to reroute the breather hose to the pinion position. If you do not the differential will pump the oil out of the differential and into the catch can while you are driving. You have to ask yourself, where is the oil supposed to be while you are driving?! Obviously if the oil is in the catch can it isn’t lubricating the differential like it is supposed to be doing. The other thing David mentions is that it doesn’t take much oil loss to damage the differential, while you are driving the differential can pump a pint or more of oil out from where it needs to be and into the catch can where it does ABSOLUTELY NOTHING! The catch can will only drain back once you have come to a complete stop, even then you have the oil that was pumped out of the catch can that is GONE until you refill the differential yourself. If your car is moving the differential oil will NOT return to the differential, the vent hose is not a two way street. Yes, the drain at the bottom of the catch can can help to return oil to the differential but the capacity is far less than what will be pumped into it. 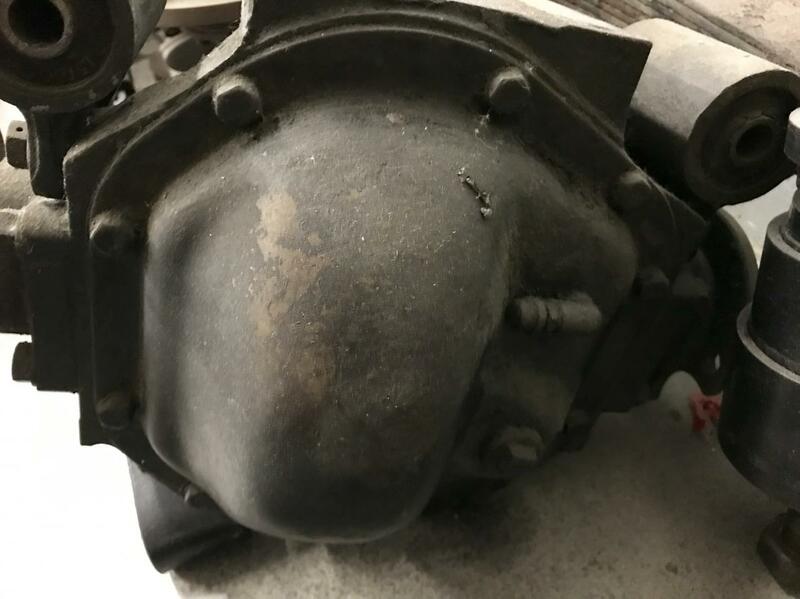 I find it puzzling why we are visiting this issue, for years manufacturers (Lamborghini, AC, Aston, Jeep, etc, etc, etc) have been using this differential with nothing but a simple vent affixed to the differential cover without issue, or leaks. Why was necessary to reinvent the wheel?! LMH and 1795 like this. Last edited by CompClassics; 04-14-2019 at 08:04 PM..